The U.S. Coast Guard and officials have honored Kathleen “Kate” Moore, the keeper of Black Rock Harbor Lighthouse on Fayerweather Island at the mouth of Block Rock Harbor in Bridgeport, CT. Moore, who kept the light for 61 years, is credited with saving 21 lives. Moore’s father Stephen Moore, an injured captain, was appointed keeper of the light, and the family moved, in 1817,to a house near the light. Bridgeport Historian Mary Witkowski said that climbing the lighthouse’s narrow steps with oil lanterns “was very treacherous, especially for Stephen whose health remained poor.” Moore (also known as Catherine) began tending the light at age 12 to help her father. “She had to walk on two planks which in stormy nights were four feet under water,” said Witkowski. 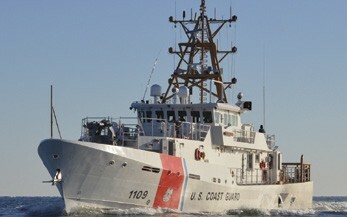 At a ceremony at Bridgeport’s Mountain Grove Cemetery on May 8, executives representing Bollinger Shipyard in New Orleans, LA, spoke about Moore’s heroic rescues and the Coast Guard’s new Fast Response Cutter named after her, built at Bollinger and dedicated May 10 in Key West, FL. Captain Ed Cubanski, commander of the U.S. Coast Guard Sector Long Island Sound, noting that rescues were part of a lighthouse keeper’s duties, predicted that one day the 154-foot Kathleen Moore will protect the waters off Bridgeport as she once did. In the 19th Century, Fayerweather Light was the only light between Eatons Neck, NY and New Haven, CT. “Sometimes there were more than 200 sailing vessels at night, and some nights there were as many as three or four wrecks,” said Moore, who cared for the people she saved. In 1871, the U.S. Lighthouse Service named her as keeper. She retired in 1878 at age 64. Connecticut First Lady Cathy Malloy spoke about people who make the world a better place at the ceremony, in which Moore’s headstone was dedicated with full military honors.